You are invited to attend a lovingly prepared Multi-Course Dinner for Both Vegetarians & Meat Lovers at Cafe Turko. Gluten free dishes available. VEGETARIAN DISHES: 1. Rainbow hummus; 2. Goat cheese salad with Turkish apricots and dressed with pomegranate molasses; 3. Beyti Wraps with Roasted Vegetable wrapped in crispy Lavash bread. 4. Wedding Rice. MEAT DISHES: 1. Lamb and Wedding rice stuffed Danish squash 2. Lamb shanks seasoned with whole spice sachets bags DESSERT: Turkish Caramelized orange topped with kefir cheese and garnished with Turkish crushed pistachios. Turkish coffee, juices and teas included in the ticket price. 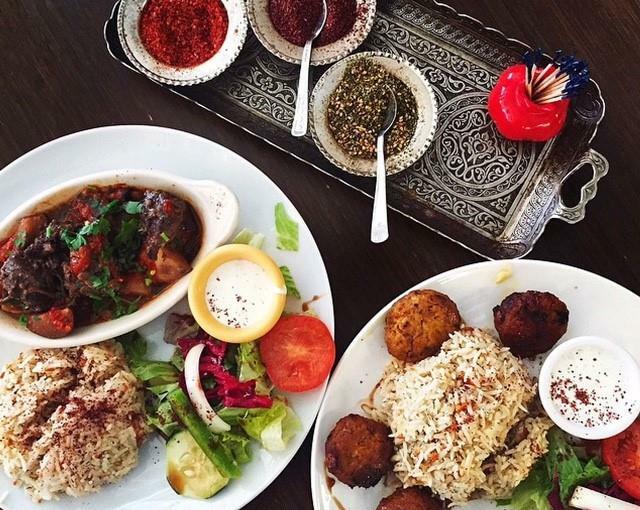 Cafe Turko is a friendly, joyful restaurant bursting with color, decorated with Turkish lamps, rugs, ceramics. We will sit at two large common tables. See you soon!